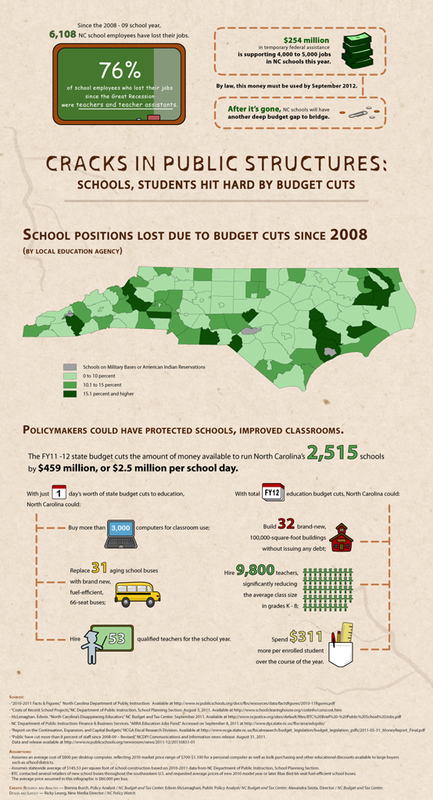 As the largest single spending category in the state budget, North Carolina’s public school system has been hard hit by the last several years of budget cuts, shedding thousands of teaching jobs as well as thousands of other educational staff crucial not only to running a school, but also ensuring that students succeed. Since state budgets are cumulative, with each year’s starting point determined by the previous year’s spending and service levels, consecutive cuts to public education have had a “snowball” effect at the district and classroom level. The Budget and Tax Center has reported on this troubling trend, which will only intensify unless lawmakers adopt a balanced approach to NC’s budget woes.